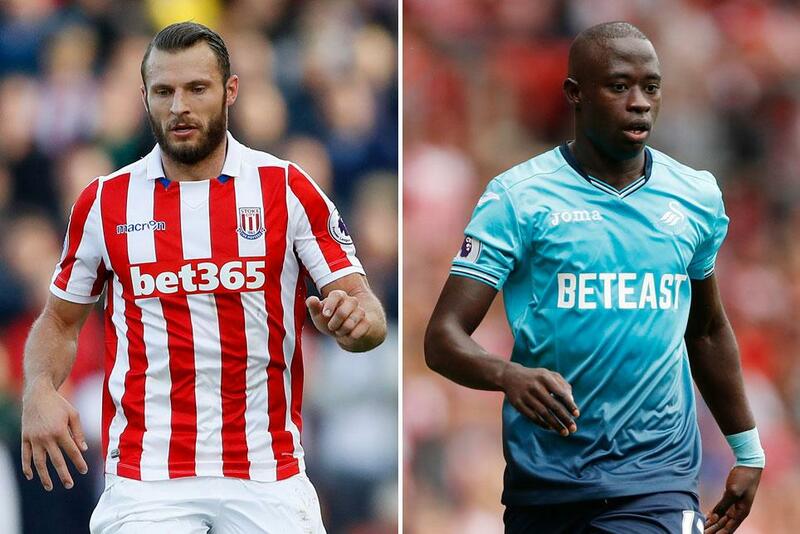 Winless after their first five fixtures, Stoke City have bounced back with a four-match unbeaten run that they will look to extend when Swansea City visit the bet365 Stadium on Monday night. Tactics expert Adrian Clarke takes a closer look at how Mark Hughes has changed his side's fortunes. Joe Allen has scored as many goals for Stoke City in his last four Premier League matches as in his previous three seasons with Liverpool. What has changed? Backed up by two primarily defensive midfielders in Glenn Whelan and Geoff Cameron, for the first time in his career Allen has a free role with the instruction to break into the penalty box as often as he sees fit. And he looks a natural. It is highly unlikely Allen's 87.5% shot accuracy and 50% chance conversion rate are sustainable in the long term, but the 26-year-old has shown a natural penchant for sensing when and where a chance might fall his way. There is instinctive variety to his finishing, too, slotting the ball home with his left foot, right foot and head during his recent streak. 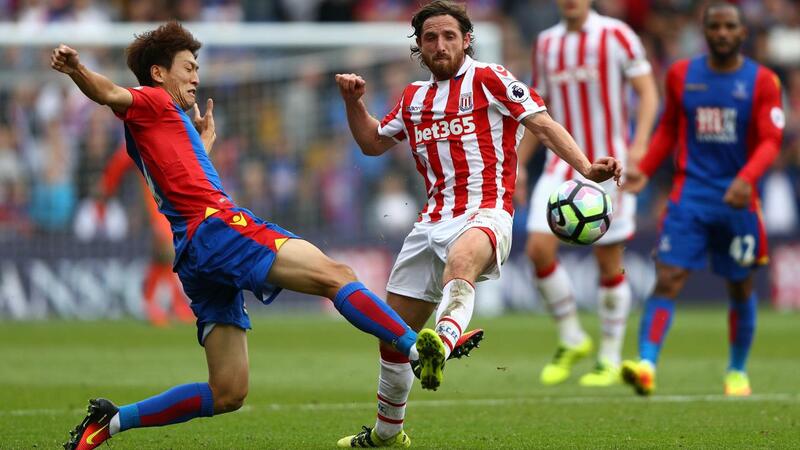 He may have been dubbed "The Welsh Xavi" during his time as a deep-lying playmaker at Swansea City, but Allen is reinventing himself as a different type of midfielder under Hughes. Scoring crucial goals is not the only positive side to his game that Allen has introduced since making his summer move from Anfield. Buzzing around the pitch with enthusiasm, Stoke are benefitting greatly from Allen's relentless energy. Perpetually on the move, either looking to break up play or instigate attacks, the Welshman man has added vibrancy to their midfield. He is hard to pin down, his non-stop movement persistently asking questions of the opposition. A look at Stoke’s average speeds in the table below highlights the point. Allen's 89.7% pass accuracy last time out at Hull City testifies his ability to dictate play with assurance. He will still put his foot in - he won eight tackles at home to West Bromwich Albion - so in many respects Allen is on his way to becoming a complete midfielder. Granted a free role by Hughes (see touch map below), Allen's former club Swansea would be advised to keep close tabs on him throughout Monday night's encounter. Hughes has made significant changes to the configuration of his starting line-up since the season started in August, and if recent performances are anything to go by, the balance of his best XI is heading in the right direction. Shifting the combative Cameron into central midfield to replace Giannelli Imbula has improved the side defensively. The USA midfielder relishes the physical battle; he won all 10 duels against Hull and is a nice fit alongside Whelan. Together, they afford Allen the freedom to push on. A composed start by stand-in goalkeeper Lee Grant has settled nerves at the back, while Ryan Shawcross and Bruno Martins Indi are also developing a partnership of promise on central defence. After some initial wobbles the pair have settled down, with a resilient display at Old Trafford handing them a welcome shot of confidence. The Dutchman looks an upgrade on Philipp Wollscheid, who has left for Wolfsburg. In the forward areas a fit-again Xherdan Shaqiri has made a big difference. Cutting in from the right on to his favoured left foot, Shaqiri can produce match-changing crosses and shots as he displayed at the KCOM Stadium last weekend with a scintillating two-goal display. Wilfried Bony is the new spearhead of their attack, and while the striker on loan from Manchester City has not scored yet, his sharpness is improving match by match. The Ivory Coast striker's ability to hold the ball up efficiently is an unheralded plus. With a match-fit Bony as an outlet, Stoke can fire accurate passes from back to front, easier than with previous options. 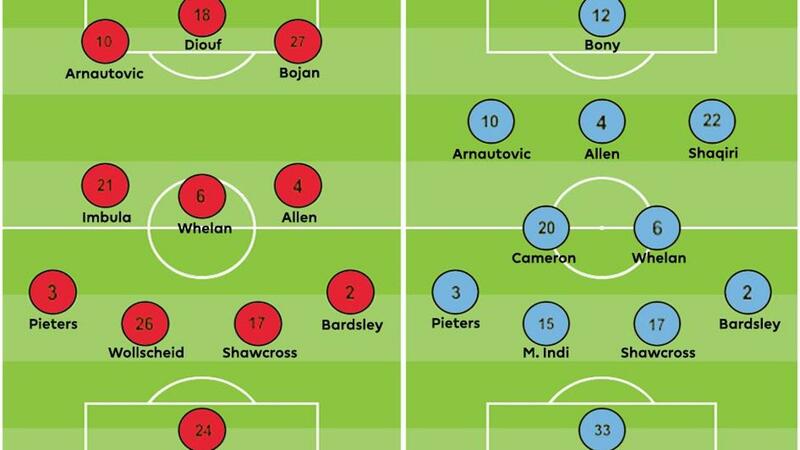 Bony is excellent at bringing Marko Arnautovic, Allen and Shaqiri into play. Stoke’s goals-against column would not look as bad had they dealt with dead-ball situations better. Their set-piece marking in the early weeks of 2016/17 left plenty to be desired. Two penalties were conceded for fouls inside the box at corners, Scott Dann and Salomon Rondon both escaped the attention of their markers to head home directly from corners, and three goals have also been let in from free-kicks wide from the right: one at home to Manchester City and twice against Crystal Palace. Hughes generally prefers his teams to man-mark at corners and wide free-kicks, but has also toyed with zonal marking in a bid to cure the problem. Swansea will view this area as a potential weakness, but having gone three PL matches with no problems dealing with set-pieces, the signs suggest that Stoke are improving. New managers often bring about a spike in collective and individual performance levels and it is fair to say that Swansea winger Modou Barrow is enjoying one of those at the moment. Since Bob Bradley took charge at the Liberty Stadium, the Gambian has been in sensational form. It is obvious the American sees the fast 24-year-old as his most dangerous creator. In the last two PL matches, from a tactical perspective, the Welsh side have fed Barrow incessantly, with 44% (v Watford) and 54.9% (v Arsenal) of their attacks generated from the right where Barrow has been positioned. Beating defenders on the outside and delivering crosses from advanced positions, the wide man will again be the man to watch, especially with Swansea right-back Kyle Naughton eager to find his winger at every opportunity. But with Stoke’s left-back, Erik Pieters, back in top form after an early-season dip, I do not think Hughes will be overly troubled by the threat of Barrow. Pieters has defended excellently in his latest outings and is one of the quickest full-backs in the division, regularly registering top speeds at around 34 kilometres per hour. This should be enough to contain the Swansea star in a foot race. As a forward-thinking defender who is obliged to be adventurous on home turf, Pieters must be careful to choose the right moments to support Arnautovic, though. If Barrow decides to 'cheat' by not tracking Pieters, Swansea will instantly look to spring counter-attacks down that flank. Dragging Martins Indi out of the middle to deal with Barrow might be a concern. The winner of this head-to-head is unlikely to end up on the losing side.